St. Mary’s Parish was founded by a small group of Episcopal women in 1886 and was the first church building constructed in Pacific Grove on land donated by the Pacific Improvement Company. On July 10, 1887, The Rt. Reverend Bishop Kip, the first Episcopal Bishop of California presided at the dedication of the “little red church” modeled after a church in Bath, England by architect, William Hamilton. The church and the parish hall are constructed of No. 1 grade redwood which is no longer available at any price today. The church was significantly enlarged in 1911 by splitting it in half and adding the choir and the first two bays on a plan devised by Lewis P. Hobart, the architect of Grace Cathedral in San Francisco. The present organ, built by Shantz Organ Company of Ohio, was installed in 1996. Internationally known organist, David Higgs, played the inaugural concert. The organ contains 20 ranks of pipes, two keyboards and a pedal-board. It has an electro pneumatic action. Some pipes are wood, others of a metal alloy of tin and lead. There are 1157 pipes on the wind chests in the loft over the console. 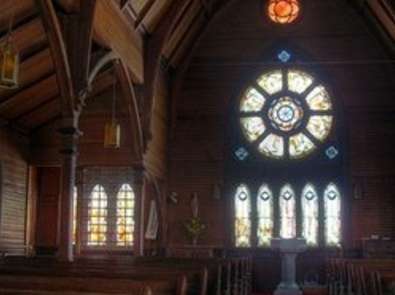 St. Mary’s stained glass windows are beautiful and each one, created and donated over many decades, has its own history and story to tell. Please consider a visit to St. Mary’s to appreciate this sacred space in person. You are welcome to join us for Sunday services at 8am or 10am.